Re/Max co-founder and Chairman Dave Liniger is stepping up as CEO, taking over for Margaret Kelly, who’s been with the company for 28 years and served as CEO for the last nine. Kelly “has decided to retire from her position” as CEO and has resigned from the board of directors, effective Dec. 31, Re/Max said. Re/Max’s board of directors has also elected Karri Callahan as acting chief financial officer, a role Kelly had taken on last month when CFO Dave Metzger began a temporary leave of absence due to the illness of a family member, the company said. Re/Max raised $225 million in its October 2013 IPO, using some of the proceeds to buy out a large shareholder, Weston Presidio, and reacquire master franchise regions in the U.S. The company has thrived since then — its share price is up nearly 15 percent so far this year, and its market capitalization exceeds $400 million. After joining Re/Max as a financial analyst in 1987, Kelly rose through the ranks, becoming a vice president in 1992, president in 2002, and CEO in 2005. She was appointed to the board of directors of the Denver branch of the Kansas City Federal Reserve Bank in 2010. A breast cancer survivor who advocates for cancer research, Kelly also received the Susan G. Komen Ambassador Award that year. According to a Re/Max regulatory filing, Kelly earned $2.5 million in total compensation last year, including a $770,000 base salary, $1.26 million in stock awards, and $460,000 in incentive pay. Liniger, who earned a salary of $2.1 million in 2012, stopped receiving a salary after the October, 2013 IPO, receiving $1.58 million in salary up to that point. 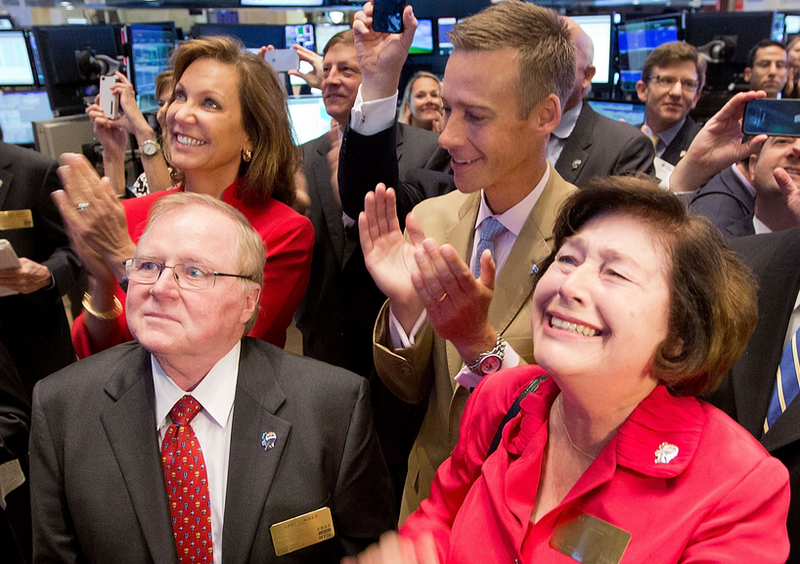 Article image credited to Re/Max co-founders Dave and Gail Liniger (front) and CEO Margaret Kelly (back, in red) celebrate Re/Max&#8217;s October 2013 debut on the New York Stock Exchange. Photo credit: NYSE.